I've had another day of shopping today, which you'll know already if you follow me on Instagram or Twitter (@truly_polished). When I went yesterday I saw a cobalt blue maxi skirt and today I went back and got it as well as a few tshirts. Since I started my blog I've mainly been buying nail polish, but now the weather is getting nicer, I'm getting inspired to buy my summer wardrobe. This summer I plan to be more adventurous with my style choices. I've always been interested in fashion, but I've stuck to plainer things that I think suit me, instead of trying anything new. I literally wear black leggings EVERY DAY and my version of mixing it up is wearing tights and a dress! So this summer I'm going to try new things with my clothes and this cobalt blue maxi dress is me dipping my toes in! I've also changed my hair from a side parting which I've had for the last ten years to a middle parting! It might not sound like much but it's a big deal to me! Anyway, today I have the last of my newer HITS holos to show you. 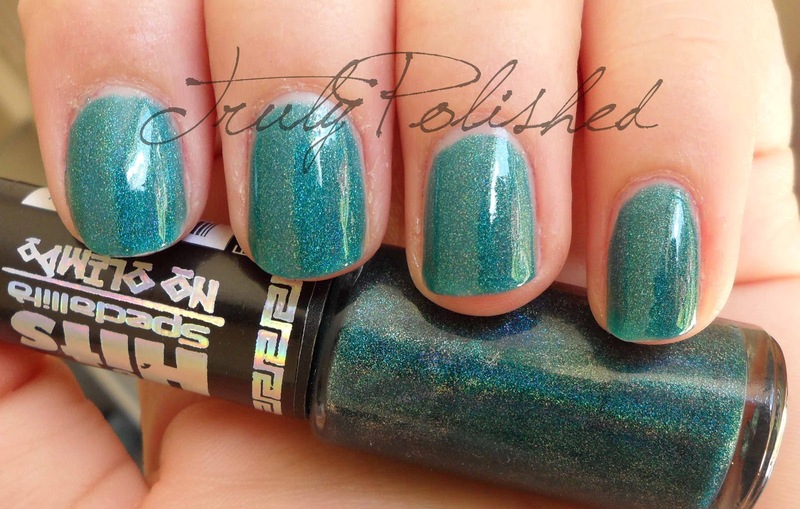 I only have the holo topcoat left after this (Hefesto) and I'm slowly but surely getting photos together for that! This is Hera, a teal holographic polish. This was so gorgeous in person but I couldn't capture its true beauty in the photos. I have no complaints about the formula of this, it went on smoothly, in two coats and covered perfectly. I didn't use topcoat for the photos below. Hera was SO much more holographic in rel life, but for some reason my camera didn't pick it up. 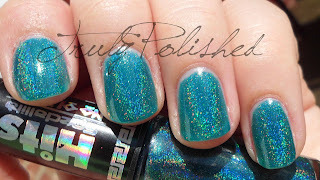 For more photos and a topcoat comparison, click "Read More"
A few days ago when I posted my KOH holographic, I did a comparison to see if adding a topcoat dulled the holo effect. I thought I'd try it again with this polish. The HITS holos are a different formulation to the KOH ones and GOSH Holographic. The HITS ones are smooth and look really glossy even without topcoat, whereas the other two dry really matte and look like clay until they've dried. However when they do dry they are about a hundred times more holographic than you could ever imagine! The topcoat didn't seem to dull the effect of the KOH polish and it hasn't seemed to here either. I used one coat of Cult Nails Wicked Fast on my index and ring finger, the comparison is below. It's a shame I couldn't get the holo to show up in these photos as well as it does in real life, but this is truly a gorgeous polish. I find it impossible to pick a favourite in this collection, they're all amazing, well the ones I've tried! I bought this for R$8 directly from HITS here but it's also available at Llarowe.